Host a Gingerbread House Contest! Host your own Gingerbread House Contest! A gingerbread house contest doesn't have to be for professional bakers alone! Host your own gingerbread party and competition for family or friends (or both) and get everyone in the Christmas spirit! 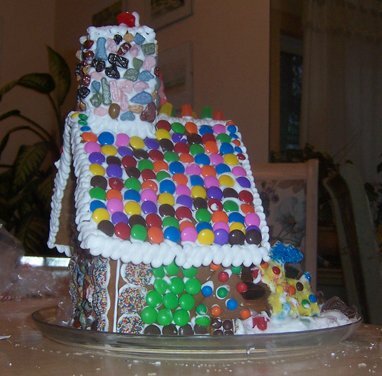 You can pre-bake small houses and then have each family decorate one to enter into the contest OR you can ask each family to bring their own pre-baked house with them for the event (send them a link to this website for instructions, templates, and inspiration: http://www.gingerbread-house-heaven.com of course! Another contest method is to have everyone create their own, individual gingerbread houses out of graham crackers during the event. The results are bound to be funnier this way (with each person having building own creation,) and there are likely to be FAR more crumbled, falling apart houses in the end. Make sure to have an adult winner AND a youth winner (or even break it down into age-ranges) or the kid-built houses are likely to win and the adults may lose interest in future years. Adults can be VERY competitive! Most importantly, do NOT forget to take lots of pictures and/or video of the event! Watch this cute video of one family's gingerbread house contest. They have about 50 family and friends coming over to build their creations each year. There's even some controversy about voting by deceased family members! Really fun! Click on the arrow to play this video. If you have a dial up or slower Internet connection, click on the pause button after starting the video and let it load all the way before pressing play to view the video. Return HOME From Gingerbread House Contest Page.